The festival "Navratri" is a nine-day festival devoted to Goddess Durga Maa, comes twice in a year, one is in between March-April and another one is in between September-October. People of India mostly enjoy last one by playing Garba and Dandiya to praise Goddess. Designer designed this especially for those want to have traditional as well as stylish touch. Look traditionally stylish while doing the Garba by wearing this beautiful Parrot Green and Blue Hand worked lehenga with Rani Color Odhani. Square block in Odhani is extra ordinary. This combination absolutely gives the royal and charming appearance. 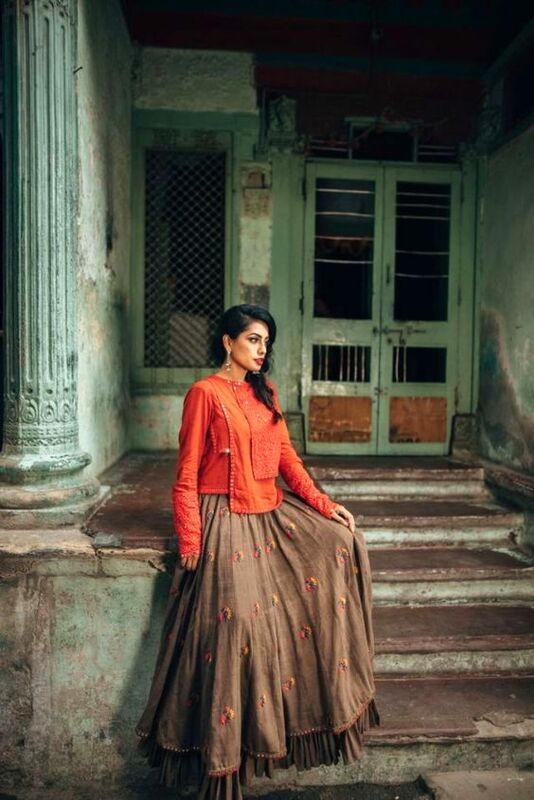 Rajwadi styled Odhani and lehenga‘s pattern is a unique combination. You can pair it with a plain blouse with the bordered sleeve.The full flared Chaniya with homemade machine’s bird print ensure charismatic look. It Stuns your ethnic look by wearing Rajwadi Style Chaniya Choli. Select the high neck and three forth sleeved multi color chaniya choli to look sober and elegant. Important benefit factor to choose this is no need to wear more ornaments. You can wear only bangles and earrings to have classy look. If you want to wear extra ordinary, select the block printed embellished chaniya choli with full flare. Solid black blouse with full sleeves adds the value. 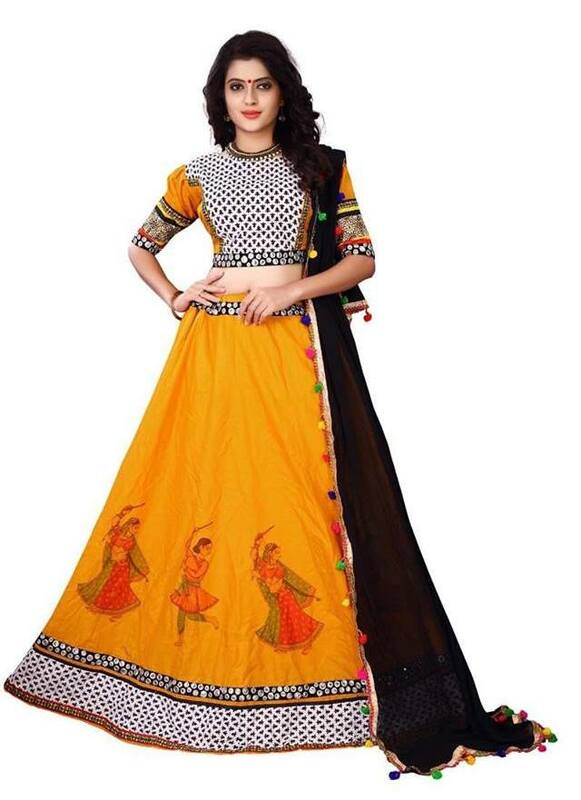 You will look charming and stylish while doing dandiya or dodhiya. Patch worked, heavy bordered and the three forth sleeved blouse is perfect for taking part in Navratri competition. Go with this blue and beige lehenga for innovative design! For a traditional look, select this heavy dupatta gamthi style chaniya choli. Wear the multi color parrot eye-catcher pom pom Juda to give a more stylish look. 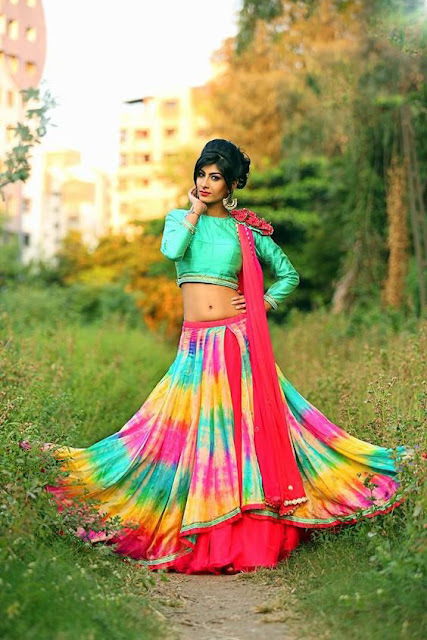 Say goodbye to the old style and wear this multi color multilayer style choli with high neck and long sleeve. 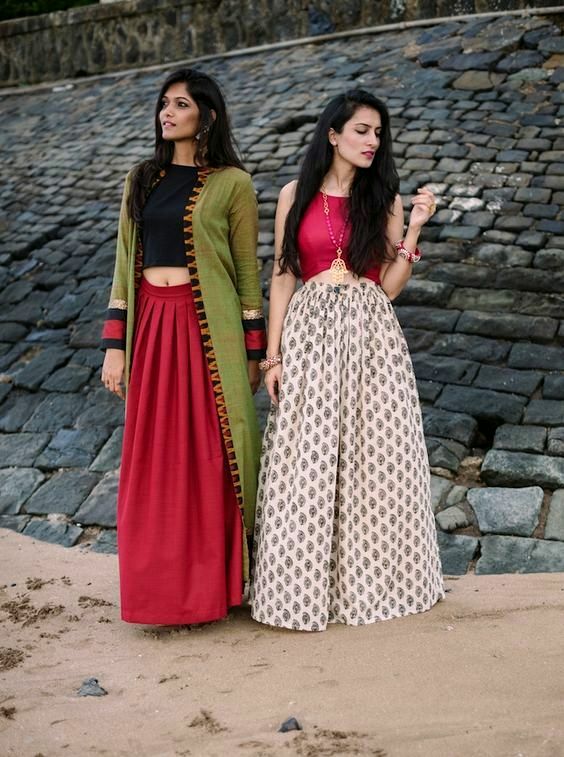 You can pair this choli with different color and styled dupatta as well as desi crafts for a unique look. Fishtail Braid hairstyle is perfectly matched with this. If you don’t want to show your skin, select this Marwadi style chaniya choli with chain pattern long sleeve blouse. The important benefit about this style is no need to wear a dupatta. In the world of fashion, style and pattern come and go. Designer comes up with the latest work is painting that is absolutely fantastic. You will look smart by wearing half and half style semi traditional chaniya choli. If you are looking for simple and sober traditional chaniya choli, select this Yellow and White combination. The waist belt is attached with the chaniya and latkan is there in between work. It is really eyeing popping combination. 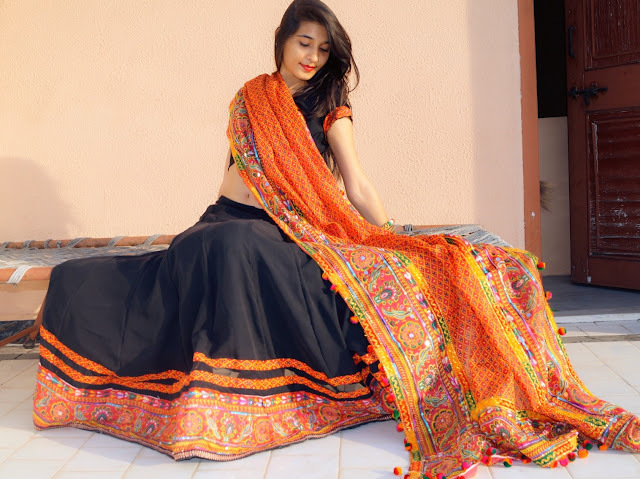 Black classic Chaniya Choli is redesigned especially for Garba consist the traditional patchwork motifs highlighted with embroidery. Have a simple bun hairstyle and long earrings to look fabulous. Pink is the color of feminine and combination of Pink, Blue, and Orange associated with softness. Chaniya with three different layers is its unique design. Pom Pom is attached in blouse & dupatta and combines resa at the end of the blouse, sleeve border, top and bottom part of chaniya. Wear this pink digital printed embroidery chaniya choli with bright shade for a unique look. This beautiful chaniya choli has cold shoulder sleeve. Western style blouse creates the western vibes on this festival! Go for Lemon Green Blouse with multi floral print chaniya choli combine with bright red bandhani silk dupatta. Wear multi color juda and colorful pom pom earrings. The colors mush and the soul brightens in the blue and dever gray chaniya choli which is gelled up with lace border and blouse is of gajji with traditional motives and mirrors. Off shoulder tops are in trend and it looks elegant to the wearer. Hand printed flared sleeve gives a modern and dramatic look. It is suitable to those who want simple and stylish choli for Navratri. Wear the trendy and bright multi color chex printed Ghaghara with contrast color long sleeve top. Dull polished matching accessories gives the absolutely charming appearance. If you are looking for sober chaniya choli that can be worn in Navratri or any other gathering faction, this long jacket chaniya choli is perfect. Benefit factor of this jacket style choli is you can pair this jacket with another choli for a unique look and back side cannot be shown.Wear this choli without jacket for a simple look. Fashion Designer recycled old kediya style blouse into multi layer mirror work multi layer blouse with arty ideas. Eye catching combination of the orange blouse with weathered woodland brown absolutely marvelous. Combination of blue and pink chaniya choli gives the rich and sophisticated appearance. It has printed multi color box pattern on the choli which looks amazing. 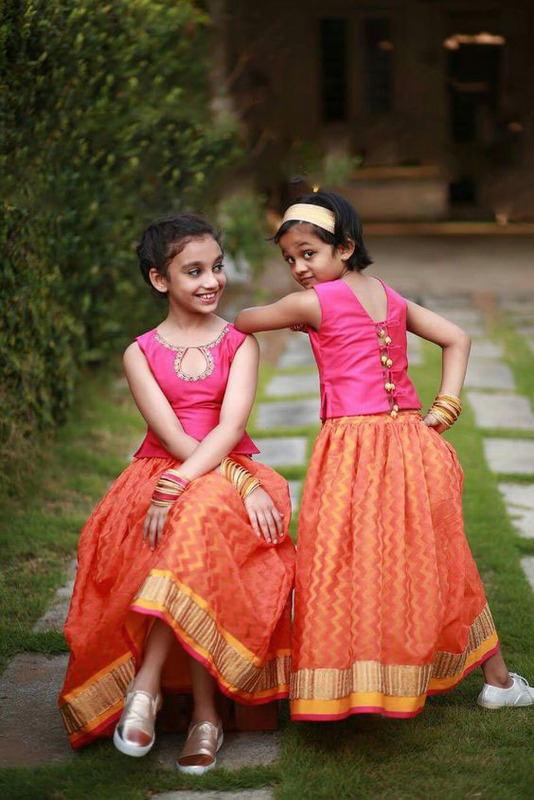 This chaniya choli is specially designed for twins girl. Select this orange and pink chaniya choli to look attractive. Artist designed embellish high neck long sleeve with patch work blouse. It has double flared multi color chaniya that heals the body and represent openness. This designer chaniya choli suits to any complexion and color combination of pastel shades give the royal appearance. Navratri is around the corner and Indian ethnic wear online shopping website brings the wide range of vibrant chaniya choli collections. Shop @ www.sareeo.clothing to get classy and stylish Navratri Chaniya Choli Collections and get the various styled like prints, digital print, block print, chex, dyeing, embroidered, double layer style, double flared style, kediya style, jacket style, hand printed, floral print, bandhani, western style, patch work etc. chaniya choli. Shop now and get a benefit of the exciting deal with Worldwide Free Shipping.